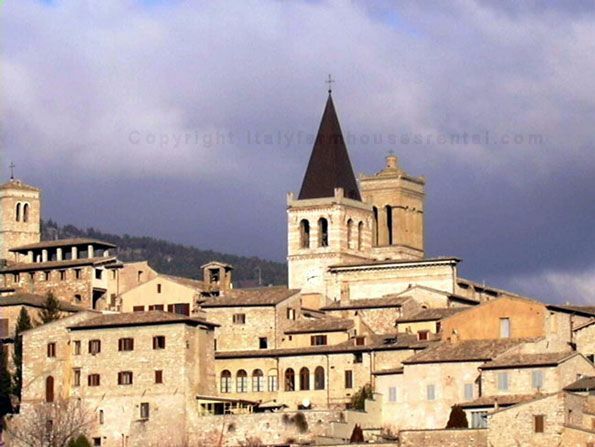 Spello is a city which travellers generally forget about due to the fame of Perugia and Assisi. 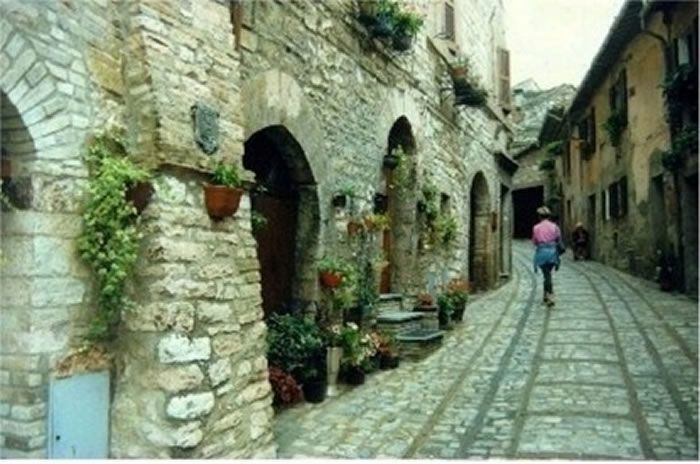 However, Spello has its own charm, especially during the sprintime when all the balconies fill with bright flowers. 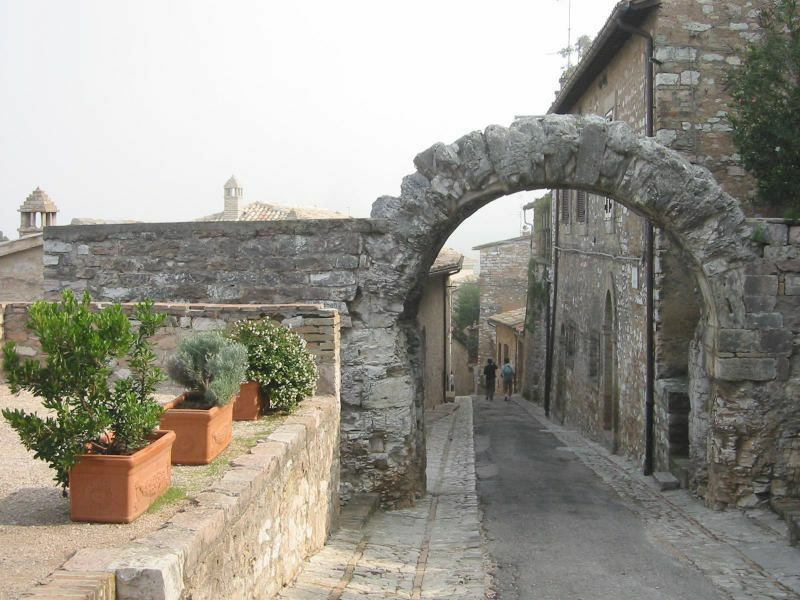 A distinctive architectural feature in Spello is its arched stone passages. The Arco Romano offers a perfect vantage point from which to admire the Antiteatro Romano, which is unfortunately not open to the public. This was the amphitheatre where performances were put on gathering an audience from Hispellum (Spello’s Roman name) as well as nearby towns. Close to the amphitheatre is the Chiesa di San Severino, a church still inhabited by Cappuccino monks. Its Romanesque façade deserves a look. Piazza Kennedy features part of a Roman gate, the Porta Consolare. Piazza Matteotti has the severe Chiesa de Sant’Andrea housing a Madonna with Child and Saints by Bernardino Pinturicchio and nearby is the Chiesa di Santa Maria Maggiore erected in the 12th century. The Capella Baglioni is a tourist attraction. It houses a beautiful fresco painted by Pinturicchio and a beautiful Deruta tile floor. The Pinacoteca Civica on Piazza Matteotti exhibits samples of the religious, artistic and architectural history of Spello. Chiesa di San Lorenzo displays religious pieces. In the north of Spello the Gothic Chiesa Santa Maria di Vallegloria constructed in the early 14th century features beautiful frescoes by Spacca. The Torre di Properzio is located by the western Roman walls and is an imposing pastiche of Roman, Medieval and 20th century architectural styles. There is a walking trail map that you can get at Pro Loco and the tourist office in Assisi showing the routes to follow through fields of flowers and olive trees all the way from Spello to Assisi, a lovely walk. On the way you´ll find Azienda Agricola, which, from time to time is open to the public for olive oil tastings. Many celebrations are held in Spello. Among them is L’Infiorata del Corpus Domini which is generally held in June. During L’Infiorata carpets of flowers fill the streets giving the town a delightful fragrance and a panorama of colours which unfolds before your eyes. You can also join the procession which takes place after laying down the flower carpets. Il Giardino di Spello is situated close to the railway station and principal bus terminal. It serves quick meals at good rates and excellent, if not the best, ice cream in Spello. Bar Giardino Bonci is on Via Garibaldi. It serves light meals, ice cream and has a perfect view from its back veranda. Il Molino on Piazza Matteotti is housed in a building built 7 centuries ago. Their truffles, winter game and legumes are just superb. Prepared using wild herbs from the nearby mountains. Enoteca Properzio serves wine accompanied with cheese, prosciutto and bruschetta. Enotecas are the only way to taste the local wine production for the local vineyards are not available to the public. They will also send cases or bottles of wines of your choice abroad. Enoteca Properzio Cantina Medievale is housed in a medieval vault and stocks good wines and food. BY CAR: the SS75 connecting Perugia–Foligno goes past Spello. BY TRAIN: the train line connecting Perugia–Foligno goes past Spello. To Perugia (duration: 30 minutes, services: every hour), to Assisi (duration: 10 minutes, services: every hour).